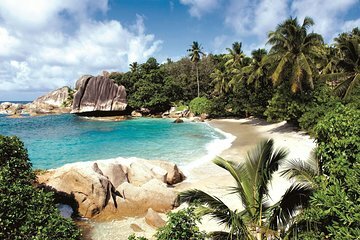 Spend a day out on the azure waters of the Indian Ocean on a small-group tour from Praslin Island. Visit the smaller, neighboring islands of Coco, Sister, and Felicite famous for their stunning underwater marine life. Spend your day snorkeling, swimming, and soaking up the warm sun while enjoying the beautiful island scenery. A barbecue lunch and round-trip hotel transfers are included. All Taxes and Landing fees. One bottle of water or one soft drink per person. Tours end with dropping off clients to their respective Praslin resorts or same pick up point area. It is highly recommended that tourists come prepared and wrap all their belongings in water-proof bags, and that they respect the safety regulations of donning life jackets and remaining seated until the craft is beached.